Despite how amazing Sydney is as a city, when you move from another amazing city like Vancouver, there’s things to be missed. I miss the people most of all of course, my family, friends and old co-workers. I miss the atmosphere of the city when hockey is on (though I’m trying to convert people here with hockey viewing parties – Anh and I have hosted one and will continue to do so! ), I miss all things pumpkin. And I miss really good, affordable sushi. 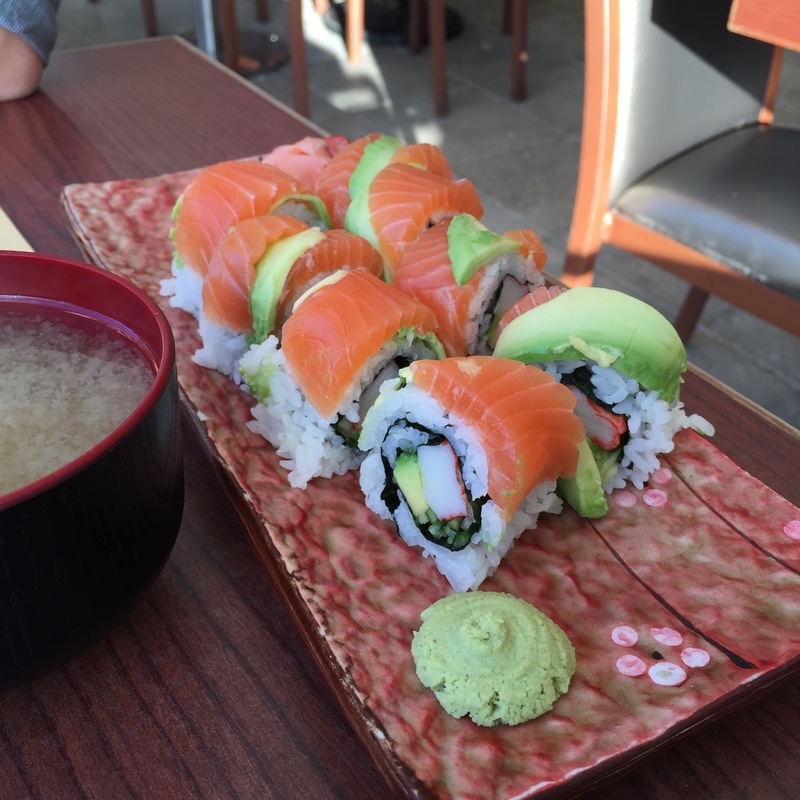 That’s not to say there’s isn’t good sushi and Japanese food in Sydney. There absolutely some great Japanese food and we’ve been able to enjoy quite a few meals, I’m just finding more and more that I have to adjust my expectations when looking at the menu when it comes to prices. No longer can I pass on a $15 bento box for being too expensive! 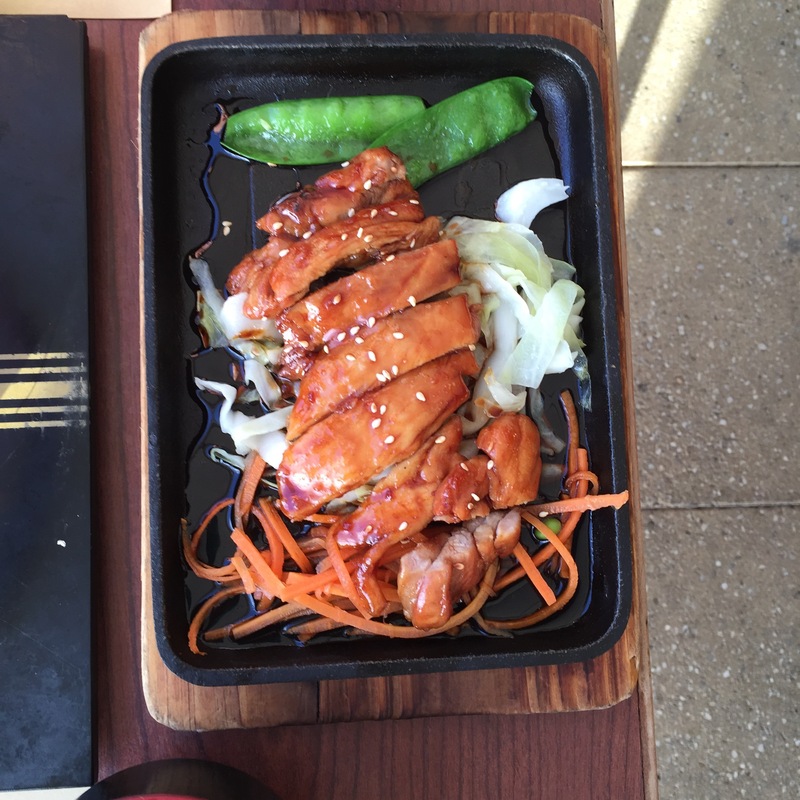 For our date night a couple weeks ago, we went to Tokio Fans in Bella Vista. I had looked at the menu and thought the prices for the appetizers were quite fair, however I should have kept looking since the prices rose from there. We choose to sit outside as it was a beautifully sunny day though with a bit of a breeze though there were protective awnings to shield most of the wind. We ordered just a few dishes, soft shelled crab, a roll and a chicken teriyaki combo. Cucumber salad, with imitation crab and prawns. We started with the salad that came with the teriyaki meal. 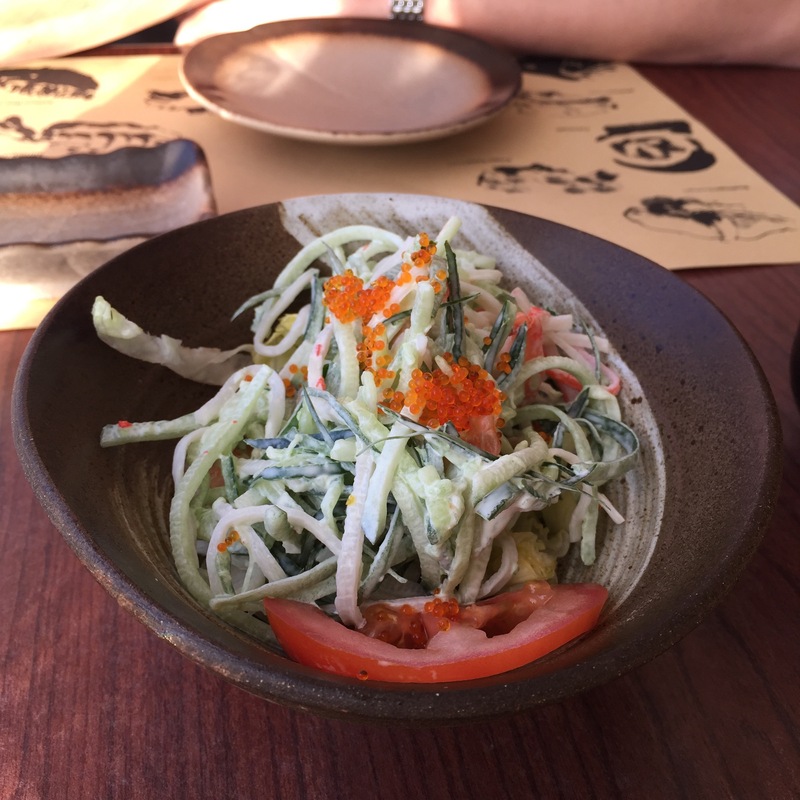 It was a nice change from the usual salad that we get, with the cucumber and imitation crab in the light mayo sauce being a refreshing way to start the meal. Next came one of our favourites, soft shelled crab. 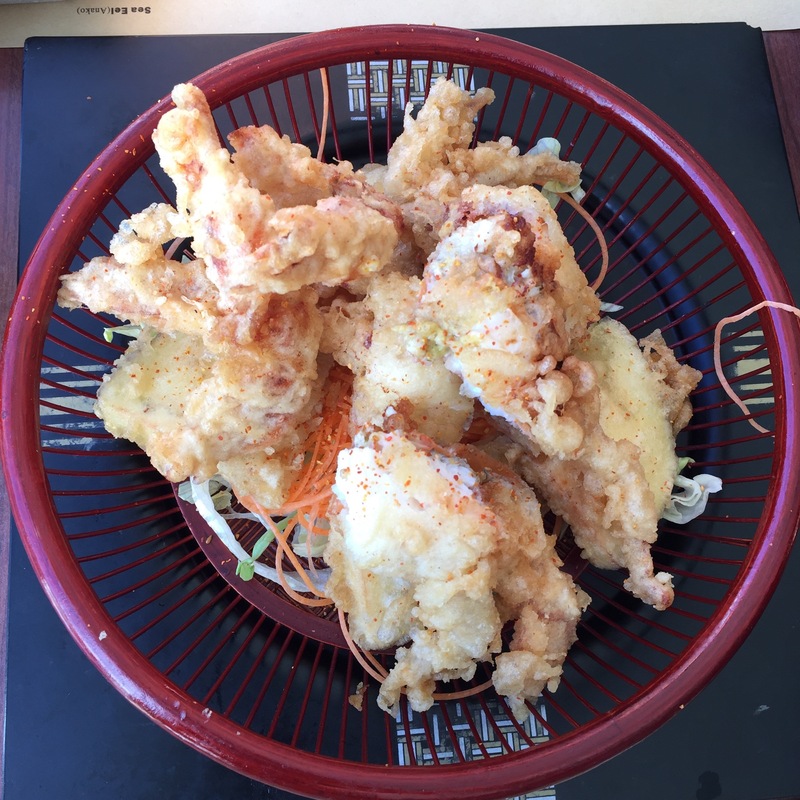 It was lightly battered and lightly fried and very tasty, and a generous serve for the $15. We moved on to our roll next. It was certainly tasty and the serving of salmon was generous, but I would have expected more finesse and more interesting flavours for $21.50. Unfortunately, this is where our disappointment started to really creep up on us. Not pictured is that this meal also came with a serve of rice and a small tempura (2 prawns, 4 pieces of assorted vegetables), however when the chicken came out I was just struck at how unimpressive it looked on the plate. As a dietitian I always encourage my clients to practise portion control as well as being aware that restaurant portions are bigger than what they may need to eat. However on the other hand, as a consumer I would also like my money’s worth. We often pack up food from our meals out and have leftovers for lunch. I suppose it wasn’t just that it was a single chicken thigh (and a small one at that), but just the small amount of vegetables that were also on the plate. The small amount of chicken was just highlighted by the miniscule pile of carrots, handful of cabbage and two (two!) green beans. 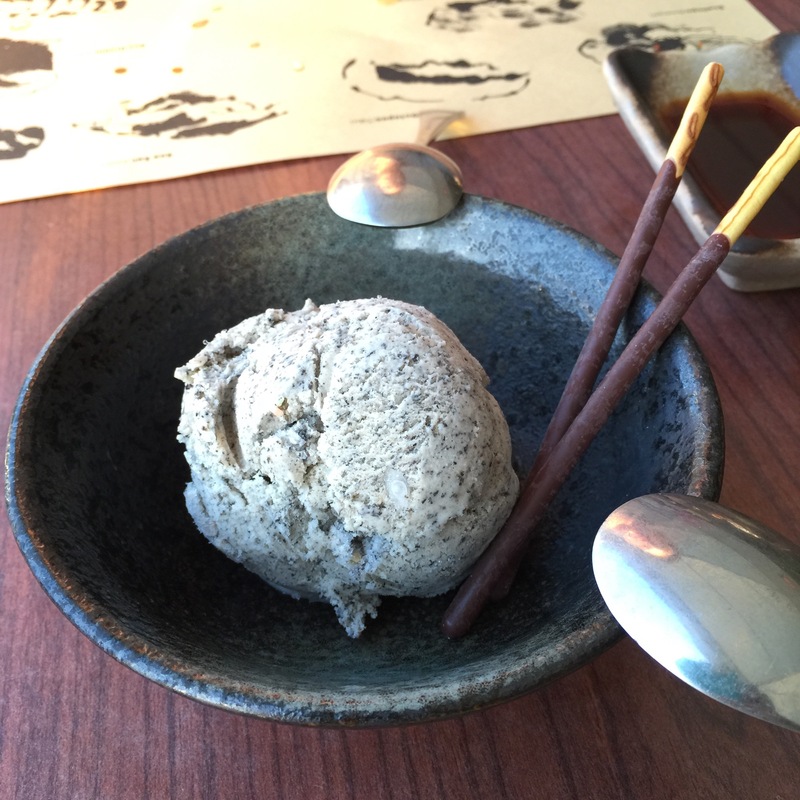 Our meal ended with a small scoop of ice cream that was also part of the teriyaki meal, which was a delight to Anh. In conclusion it’s not that we didn’t enjoy our meal at Tokio Fan, everything was tasty and we certainly didn’t leave needing a stop at a drive through. However, for what we paid for the meal, it just makes me want to find other Japanese alternatives in our neighbourhood.